Disabled access regulations now mean that bed and breakfast owners have a number of responsibilities for providing information and access for disabled guests, or potential guests. For some, the thought of modifying their premises can be a daunting prospect but for others it can be treated as an opportunity. The main thrust of the Disability Discrimination Act (1996) was to place the onus on all 'service providers' to pride a statement of accessibility for their buildings, and bed and breakfast businesses are likely to be treated as service providers under the terms of the Act. This statement should describe the access to the premises and facilities that will make a disabled person's stay easy, such as ground floor bedrooms and ramps rather than stairs. The statement can also cover negatives too, perhaps pointing out a step climb to the front door or a staircase to part of the building where you have not been able to install a ramp or lift. This is to allow disabled customers to make a fair assessment of how easy it will be for them to use your property. In truth the legislation can, if read one way, insist that you do everything to allow all disabled guests to access your facilities. On the other hand, the word 'reasonable' has been slipped into it, so as long as you have proved that you have taken 'reasonable' steps toward providing disabled access, then you have complied with the law. It's probably better to tackle this problem by treating it as an opportunity. There are over ten million registered disabled people in the UK with an annual spending power in excess of fifty billion. Because of medical improvements and the increasing technological advances in aids for the disabled, not to mention the aging population, those numbers will continue to rise, not fall. There is significant help for tourism businesses both from the government and organisations like Tourism For All, an organisation providing information and training on disabled guest access for tourism businesses. There are many things that you can do that are quick and easy, such as reprinting your standard information in large print to the visually impaired, a doddle if it's all on a computer. More expensive projects, such as installing ramps, lifts and hoists, may be difficult or almost impossible to implement because of the age or location and layout of your premises. If that's the case, consider switching the accommodation around so that you have more downstairs bedrooms which are usually easier for people with disabilities to access. There are other things that you can do as and when you are replacing or renewing items in the usual course of your maintenance programme. For example, if it's time to replace the taps on some of the basins, baths and showers, then buying longer levered taps will not be significantly more expensive than ordinary ones. That then gives you another thing that you can advertise to the disabled community. The disabled community is very loyal. If you can genuinely advertise your premises as fully accessible for certain disabilities then you are providing a powerful marketing hook. 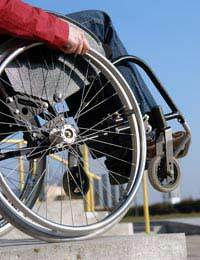 There are a large number of active disabled websites where you can reach this growing market. And remember that for every disabled guest coming along, there are likely to be other members of the family holidaying too, so the potential for providing for the disabled is bigger than you might think. @Born to a B&B. You should make it clear on all publicity and to anyone booking, that there is no disabled access due to the nature of the building. I've just purchased a small but very pretty property to run as a B&B (downsized from a guest house, 20 yrs in the business), but the property is small and narrow; I can't see how to make it accessible for wheelchairs. Narrow entryways, narrow stairway, different levels in floors on all levels and only one small room downstairs for a lounge/dining room.How can I comply with Disabled regulations...I can't even make reasonable alterations.If I were to provide for other disabilities (hearing/sight impaired) would that be considered reasonable?